If you think stevia is the new fashionable plant out of nowhere, think again. It was already used by the Guarani Indians of Paraguay before the arrival of the conquistadors to sweeten the yerba mate. But what do we know of it today? Can we tame this sudaméricaine the garden? You will easily find this perennial garden center. If, however, you want to grow it from seed, know they need heat to germinate, (around 25 ° C). A porch or a small greenhouse is ideal. Fill a container with potting soil and planted wet the soil well. Tamp the first time and then sow the seeds. Cover them only sifted soil and tamp again firmly. Then it will always keep the soil moist. Check your tank at least twice daily and spray thoroughly. Do not let the sunlight tray, give it rather indirect light, so you do not cause excessive evaporation. The seed should germinate within two weeks. Be careful to take care of small seedlings. Indeed, you are not the only one to enjoy the sweet taste of the sheet. Snails are also greedy. Look good in your bin or under your buckets to remove any snail or slug. They may go unnoticed until they shave your shoots! The plant loves the rich and organic-amended soils. So prepare a place in the garden where you will incorporate a healthy dose of compost or manure. 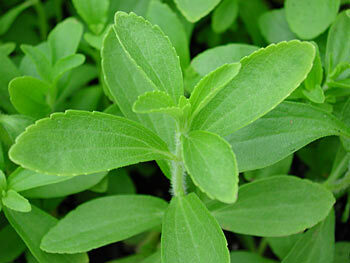 Stevia appreciates exposure in full sun or partial shade half sun, which requires regular watering. She resents the gel will therefore require the indoor winter but likes well in pots on the balcony or on the edge of a sunny window. In an environment (sun, rich, moist soil), your stevias should produce an abundant mass of leaves. • Cut off the branches and dry them on a rack in a dry, well-ventilated and away from direct light. If the branches are stacked on each other, return regularly for even drying. You can also tie them together and hang them upside down. Once dry, detach the leaves. • Spray in a coffee grinder a small amount of leaves. Pass the powder through a fine mesh strainer. Recover the larger pieces and repeat the process until fine spray. Keep the powder in an airtight jar in a cool, easy to reach, ready to use.